The tranquility of the beaches will leave you speechless. Olimpiada is the greatest place to be, for summer Holidays. Once you visit, you never forget to revisit. Summer is for Holidays at Villa Pavlina. You are so welcome to visit us. Olimpiada Village: Those wishing to practice can choose between a basketball court, a football pitch or the beach volley. In the village there are shopping markets, bakeries, patisseries, restaurants with excellent seafood tastes, of course there is no lack of coffee places and pizzerias. The children’s playgrounds of the village gather children of all ages. There is no bank, but there is an ATM machine. Olimpiada was built in 1923. The present village is built along a 8km long sandy beach with mountains and beaches. Every year on 7 July celebrates the saint of the village St. Kiriaki and residents organize one of the most famous summer festivals of Halkidiki. In August the village precious the philosopher Aristotle with various events inside and outside the site of Ancient Stagira. 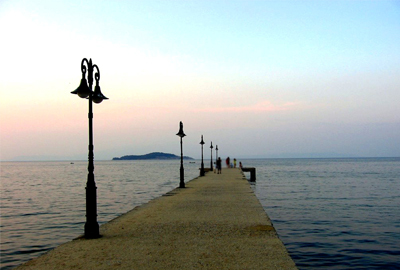 Seaside Of Olimpiada: Halkidiki is known for its excellent beaches. Olimpiada is no exception. It has the most special beaches that anyone can imagine. Shallow beaches for children, deep for adults, medium-sized, with waves, quiet ones, isolated, organized, immobile, for scuba diving, for fishing, for a walk, to enjoy the haze, the sunset. A beach for every taste that surely you will find the perfect for your own. 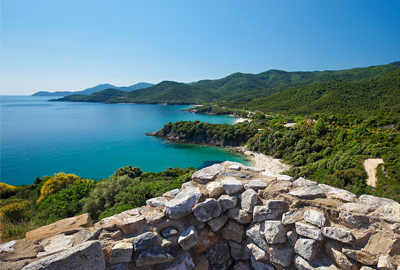 Ancient Stagira: The most important historical site of Halkidiki is Ancient Stagira, located east of Olimpiada in the bay of Liotopi. The city of Stagira was founded in 665 BC. The city the Philosopher Aristotle was born and became his last home, as his tomb was recently discovered. Walking is really enjoyable alongside steep cliffs and boulders. Aristotle here taught his disciples, such Alexander the Great. An attempt is made to be known the paths he was walking along with his disciples. A small museum is under construction nearby the ancient area. 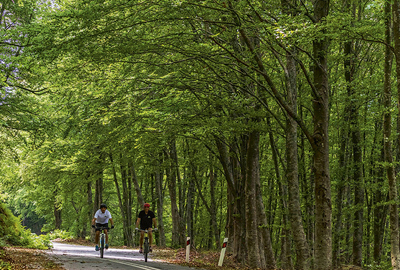 The rich forest of Mount Holomontas is usually snowy in winter and offers plenty of cool weather in the summer. It is ideal for walks, walks between pines, mosses, oaks, beech trees and oak trees, while its streams and springs are abundant. Its biodiversity favors a great deal of wildlife and birds. At the waterfalls of Varvara are hiding, two cascades surrounded by boulders and wild trees, such as hazelnuts. The scenery leave you a sense of calm and mindfulness. It is also protected by Natura 2000. Kaukanas Island: The are many stories about this wonderful little island. 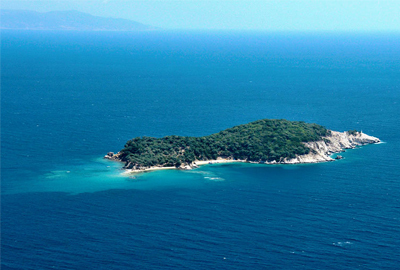 It is 2.5 miles from the village, with 2 beaches for swimming and 2 caves for the dive explorers. According to ancient writings, Stravon refers to the island under the name of Capros, which is located opposite the harbor of ancient Ancient of all Stagers. 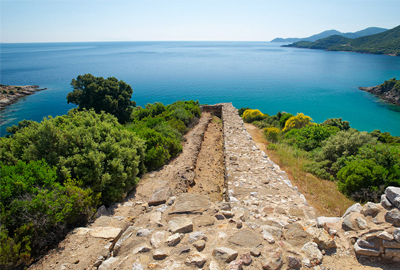 According to other ancient writings, King Kassandros had married this mother of Alexander the Great, Olimpiada, thats how the village, got it name. 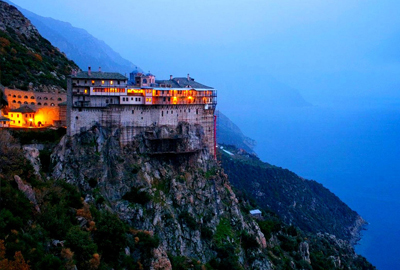 Mount Athos: The most important center of orthodox monasticism since the end of the 10th century and is one of the world’s most important monuments of cultural heritage. It is located at the 3rd leg of Chalkidiki with a length of 45km long and 10km wide, and its name came from the homonymous peak of 2033m altitude. According to the tradition, Theotokos, leaving Athos together with Evangelist John, when they went to visit Lazarus in Cyprus and amid a terrible storm, disembarked in the area where the Monastery of Iveron is today. The Virgin Mary admiring the landscape asked Christ to grant her the gift of the mountain. So it happened. Since then this place has been named the Perivoli of Panagia. There are 20 Holy Monasteries and 12 Sacred Sacraments. Unfortunately, no women allowed to visit. Only men. But there is the possibility for them admiring it by boating.